At Line-X Sioux Falls, we understand just how important it is to transform your truck or SUV into a one-of-a-kind machine that not only helps you do your job, but is also a reflection of your personality and style. 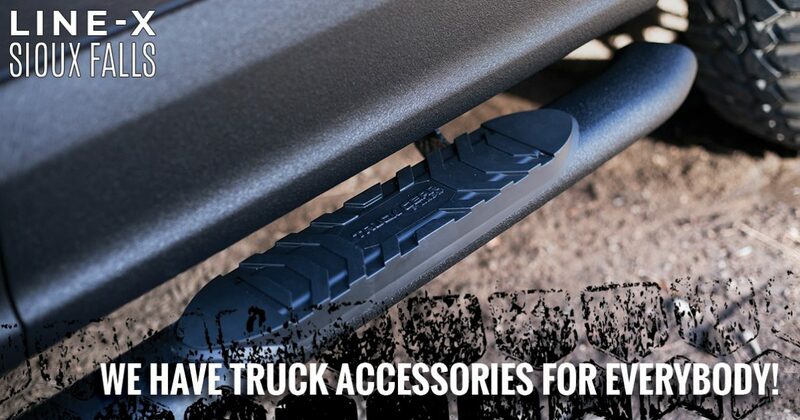 To help you attain this level of personalization and utility, we offer a wide range of truck accessories that are useful to everyone — from weekend warriors to seven-day-a-week workers! Contact us today to receive a free quote on the Line-X bed liners and protective coatings we offer, as well as the tonneau covers, nerf bars, grille guards, and other truck accessories you want. Line-X is an ultra-tough spray-on coating that is used to protect your truck’s bed, as well as many other surfaces (undercarriage, wheel wells, rocker panels), from damage caused by everything from the weather to off-roading hazards like rocks and trees. Tonneau covers protect the items you have stored in your truck’s bed from damage caused by the environment as well as from theft, while grille guards stop rocks and other environmental factors from damaging the front end of your vehicle. Nerf bars are a great way to make it easier for you and your friends, family, and coworkers to get in and out of your truck. Contact us today to learn more about the truck accessories that we offer in Sioux Falls!